Did you know that 40% of small business owners are not confident they’ll be able to retire before age 65? Our latest infographic, “Small Business Retirement: Investing in Your Future” explores why small business owners are not saving for retirement - and why they should reconsider. 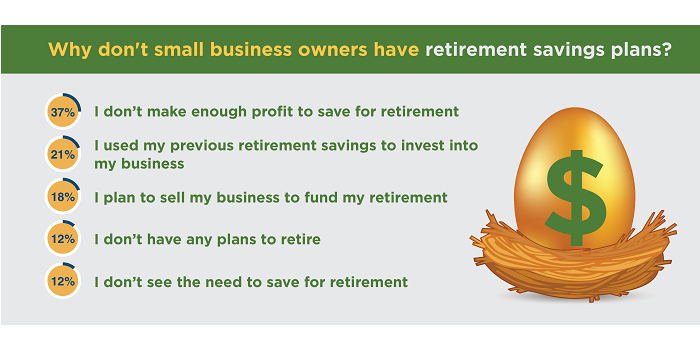 Aside from not saving for their own retirement, small business owners are also less likely to offer retirement plans to their employees. When comparing the size of a company to their employee retirement packages, small businesses were the least likely to provide retirement options. These statistics demonstrate that as businesses grow, the need to offer retirement plans grows with them. In a separate study, employers explained their reasoning for not offering retirement plans to their employees. Despite data showing that the benefits of providing employee retirement plans heavily outweigh the negatives, there is still a persistence among small businesses to eschew setting them up. Expense continues to be the top reason why, even though most retirement savings plans cost employers only 2.4% of an employee’s compensation. For small businesses watching every penny, this seems to be reason enough. While the vast majority of small businesses cite expense as the top reason why they don’t implement them, there are a multitude of benefits associated with retirement packages that small businesses may be overlooking. When small business owners who do provide retirement plans were asked why they chose to do so, their answers were telling. When it comes to planning for retirement or providing retirement options for your employees, the benefits are significant. Not only is there a clear equivalency between retirement plans and growth, there is also a tangible impact on the quality of employees that small businesses attract and how engaged those employees are once they’re on the team. If you’re interested in setting up a retirement package and would like some guidance, reach out to a SCORE mentor to determine the best options for you and your business.